Louis Nowra is one versatile and prolific writer, having written novels, non-fiction, plays and screenplays, essays and even libretti. Into that forest is his latest work. It was shortlisted for the Young Adult Novel prize in the 2012 Aurealis awards and the Ethel Turner Young People’s Literature prize in this year’s NSW Premier’s Literary Awards. I read this for my reading group. We don’t often do youth literature but every now and then one pops up that we think might interest us … such as a book by Nowra. Me name be Hannah O’Brien and I be seventy-six years old. Me first thing is an apology me language is bad cos I lost it and had to learn it again. But here’s me story and I glad to tell it before I hop the twig. And what a story it is … this novel feeds into several Australian, and wider, literary traditions. There’s the lost child and the feral child motifs (reminding me of Dog boy). There’s Tasmanian Gothic, and there’s also a bit of the fairy-tale about it. Subject-wise it covers some significant ground: environmental issues (involving both the extinct Tasmanian tiger and the whaling industry) and what we’d now call Post Traumatic Stress Disorder. This might sound rather mechanistic, but there’s no sense of “ticking off”. It’s not didactic, and it’s all logical within the framework of the book. Set in the late 19th century, it tells the story of two young girls, Hannah (then 6) and Becky (7) who find themselves lost in the bush (oops, forest!) after their boat capsizes in a storm and Hannah’s parents drown. They are taken in by a Tasmanian Tiger pair, and live with them for four years. Meanwhile, Becky’s father, Mr Carsons, is out looking for her. Eventually they are found, but the process of re-integration is not easy. The novel has a small cast of characters, which keeps it tightly focused. Besides Hannah’s parents who die near the beginning, there’s our two young protagonists, Becky’s father, his friend Ernie, the “tiger man”, a few other minor characters – and of course, the tigers, named Dave and Corinna by Hannah. God knows where me sense of survival came from. Maybe it’s natural cos humans are just animals too. There is a bogey man here – the tiger man or bounty hunter, whom Hannah had met before, through her parents. To the girls he is more brutal than the tigers. He’s “evil”, kills tiger pups, does “stuff to himself that were rude”. But, perhaps, he’s just another survivor, albeit a not very pleasant one? She didn’t want to forget. Me? I thought it were stupid to try and remember like Becky did. I didn’t see any use for it. Me English started to shrivel up, like an old dry skin a snake gets rid of. It just lies there in the grass rotting away and then vanishes with the wind. I took to talking in grunts, coughs and hoarse barks like the tigers. This annoyed Becky no end. But it were simple – the tigers understood me. Becky warned I were making a mistake. You will forget your language. You will forget your parents. You are becoming an animal, she’d say. Why argue with her? She were right on every level. she were really stubborn if she wanted something. She were brave, she were stubborn, she were smart, she were tough. Unfortunately, Becky is not as tough – or as adaptable – as Hannah thought, and consequently precipitates the novel’s rather shocking conclusion. It’s a pretty bold novel – but less so than, say, Lord of the flies. There’s plenty to discuss, particularly regarding the subjects I suggested at the beginning of the post. The big theme, though, the one common to feral children books, has to do with defining our nature. What separates human from animal? What would you do to survive – and what would that say about the essence of humanity? Good stuff for young adults, and a gripping read too for we older readers. Sounds good, and I have reserved it at the library. If I think it is suitable I will buy it for my grandsons who live in Tasmania. The eldest aged 9, is always asking me for more books! Ah that’s right, Meg, you have a Tasmanian connection. The website says for 15-18 year olds, but I saw someone else say 11-12 year olds. There’s nothing really to say a 9 year old couldn’t like it if they can stick with the language. Let me know what you think. Oh, and I was going to say, I remember the ongoing search for books for my son when he was grade 3 and 4 … a real challenge to find something suitable for the age but challenging enough for a good reader. It’s probably getting easier but I suspect it’s still a challenge. A great review, thanks. I might get a bit tired of the voice, but if it’s told in a connected narrative style, I’m sure I’d get used to it. I wonder how you think it compares with Dog Boy (one of the most gripping stories I’ve read) not just in subject matter, but in treatment? Did you read Carey’s True history of the Kelly Gang Christina? It’s also told in an idiosyncratic voice and is much longer than this. I didn’t find the voice a problem at all though one or two in my reading group did. As for Dog boy, in many ways they traverse quite similar ground but I think Hornung tackles the complexity of the situation more directly than does Nowra. This may partly be the result of telling the story 3rd person so she can introduce more viewpoints, and it may partly be because Nowra’s does seem to have targeted young adults so his focus is perhaps generally more visceral and emotional, not that Hornung doesn’t do this as well. Also, perhaps because Dog boy is set more recently, I think we get a more nuanced response from humans when the child re-meets the human world, and that adds to the complexity presented by Hornung. On the other hand, by setting his earlier, Nowra leaves a lot open for his readers to consider about the past and the present. Good question, and I’m not sure I’ve answered it well, but that’s off the top of my head. I loved Dog boy. Time will tell how much this one resonates after a few years have passed. This sounds like something I could propose to my hyper-lazy son 4 whom I’ve never been able to entice to read. Meanwhile son 2 reads books three times over including my novel! You could give certainly give him a go with this one. Your son 2 sounds like my daughter who’d read books multiple times. I never really did that … Except for Jane Austen! This sounds well done. We do have a certain fascination for feral children stories. Are there any feral adult stories? I can’t seem to think of any. Maybe that says something too on how we view adults and children. Hmmm. That’s a good question Stefanie … I expect it’s partly how we view children. More adaptable, less judgemental but also probably more in need of care if they get lost. It’s probably also about believability … Would we believe that an animal would take in an adult? Oh, I would definitely have wanted to read this as a “young adult”! It reminds me of one of my favourites in primary school, something about a girl who had lived with seals, and in the end she chose to go back to the water… it, too, was written in a unique way, language-wise. I remember the book was in her voice and the language followed/shifted her progression into “learning” to be human, and then started to slip away again… oh this is so vague, but I’m remembering as I type! Oh, I wish you could remember this Hannah … I was thinking of you as I read this, thinking you would have liked it. You’d probably enjoy it now too if you were around. The language aspect is interesting … And is probably something that attracts writers. Thanks, Lois, it is different from the majority of young adult fiction out there, that’s for sure. 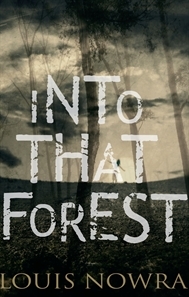 I read Into that Forest last week , and thought it was a good young adult read. I don’t think my grandson would appreciate it as much as I did. He knows the Tasmanian ‘forest’; has over three hundred acres to explore on his motor bike and quad. I loved the earthiness of this book, the environment, the nature, the smells and simple delights of a warm bed and full belly. However, I did find a few things unbelievable. I think Sonya Hartnett young adult books will be more satisfying for my grandson. I just love her books so I maybe biased. Sonya Hartnett is one of my guilty gaps. I have given her to young adults a few times and have meant to read her myself but somehow keep not getting to her.